Lead jigs can be made at home very cost effectively. Try to get a mould that will make sinkers or jigs you use most often rather than a mould that makes many different ones that you will never use. Many fishing clubs have moulds that members can use. Lead fishing sinkers are one of the biggest selling items of fishing tackle. Everyone who has ever been fishing has lost at least a few sinkers. Surfcasters fishing in difficult conditions when the surf in burying their gear can easily loose sinkers on almost every cast, as can anglers fishing from a rocky shoreline, especially if trying to cast over a line of kelp! Jig fishermen will also be aware of the terrible toll a rough bottom can take on their supply of jigs. When chasing kingfish the preferred method is to drop the lead jig quickly to the bottom, and then wind it back up to the surface flat-out in order to trigger a strike from the predatory kingfish, which incidentally prefers to go after the fittest and quickest swimming prey species. Jigs that aren’t busted off by kingfish wrapping your line around underwater obstructions are otherwise lost from snagged on the bottom. 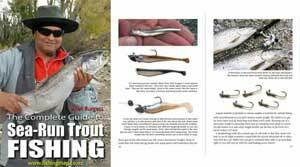 There are steps you can take to minimize losses such as fishing with a single hook instead of a treble in order to reduce snagging on the bottom, as well as fishing with heavier line, stronger leaders, and/or weaker split-­rings so that only the hook is lost. But nonetheless jig losses are still inevitable. If you are camping at French Pass, in the Marlborough Sounds, chasing kingfish for three weeks at Christmas, the cost of lost jigs can exceed all other costs associated with your holiday by a factor of three! Many anglers have worked their way around this huge expense by making their own fishing sinkers and jigs with an inexpensive jig mould. The savings from making your own are considerable. For a 200 gram jig the cost of a shop bought model is around $7.00 while the same can be made at home for less than 50 cents each – even if you have to buy the lead. Invest in the proper safety gear right from the start. Leather gloves, face mask, eye protection. Lead fumes are very poisonous! However, perhaps just as important as the cost saving is the enjoyment to be had from catching fish on something you made yourself. You can also make your own sinker and jig designs that would otherwise be unavailable from the shops. Lead is a wonderful metal that can be easily melted and cast into almost any shape and form. The obvious advantage for the angler is its considerable weight for a given volume. One cubic foot of lead weighs 710 pounds. This is eleven and a half times the weight of an equivalent volume of water. A cubic foot of cast iron would weigh only 470 pounds, copper 547 pounds, and silver 650 pounds. However lead is surprisingly not the heaviest of metals. A cubic foot of quicksilver would weigh 847 pounds, gold 1,200 pounds, platinum 1,260 pounds, and the extremely heavy and rare iridium actually weighs twice as much as lead by volume! The process is thousands of years old. Even the Romans made lead pipes! The first step in “making your own” fishing sinkers and jigs is to purchase a mould. These are available at many tackle stores. Some shops stock a wider range than others do. If you can’t see the particular shape of jig or sinker mould you require on the shelf, you may be able to convince the assistant to order one for you from his catalogue. After all you can’t expect a shop to stock every single mould available. There could well be several hundred different ones made. You might also find the shop more willing to order one for you if you pay for it in advance, or at least pay a deposit. When it comes to selecting a sinker or jig mould try to pick one that will be the most useful for the sort of fishing you do. 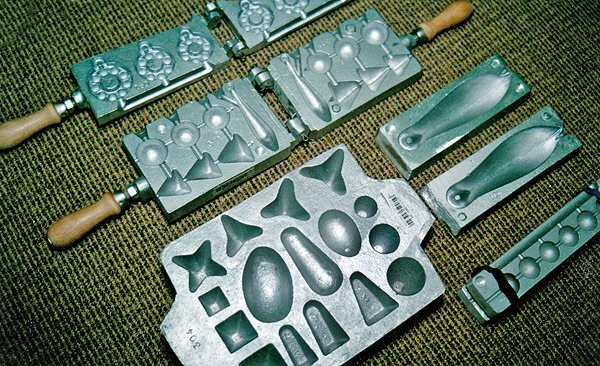 For example, some moulds are available that make ten different shaped sinkers which is fine, but not much use if you are only ever going to use one of them. If you are going to be sea fishing the most useful jig sizes are 125, 150 and 200 grams. If you are want to go jigging in deeper water, or in strong currents, a jig mould that produces one 300-gram jig may be a better option. For the same reason if you mostly go surfcasting with heavy gear in rough water, as I do here in Canterbury, a fishing sinker mould that will produce a sand spike sinker weighing 150 grams (6 ounces), or even 200 grams (8 ounces), is the better option. Lead about to be melted down. Warm the mould before your first pour. After this it should hold its heat as you make successive pours. The next item you need is a cast iron pot for melting your lead. This should also have a pouring spout. Cast iron is the best material for the pot because it holds its heat very well which prevents the lead from hardening too soon when you take it off the heat. Some of the leading tackle stores have the proper pots available for this purpose. I have a pot that holds 6 lbs of lead, but they are available in larger sizes. You also need a supply of lead. You can buy lead for a dollar, or so, per kilo from scrap metal merchants. It will be cheaper when purchased in the form of old used pipes and sheets. You can expect to pay a bit more if it has been cast into ingots. At this price it will still be much cheaper than buying fishing sinkers or jigs at your local fishing tackle shop. Don’t worry if the lead is a bit dirty or has been painted. Any debris will float on the surface of the molten lead and will be left in the melting pot after you have poured your sinkers. Just tip out this waste “slag” before adding more lead. Always wear long leather gloves when pouring lead to protect your arms. Note the G clamp to hold mould closed while pouring lead. For those unfamiliar with casting lead it is a bit of a surprise at first as to just how much lead you can get through. A kilo of lead will only make five 200-gram jigs. If making jigs you need 18 ­gauge stainless steel wire bent to shape and placed in your mould before casting. You will find this job much easier if you make up a “jig” by hitting two nails into a scrape of wood and simply bending the wire around them. This will save having to measure each one! Stainless steel wire is not generally available from hardware stores. They will only stock galvanized or brass wire. These are no good because they are too soft. After a long fight with a good kingfish, for example, a stainless steel split ring can cut through brass wire. Some of the top tackle stores also carry the wire you’ll need. This is Mason single strand stainless leader material. Otherwise you will have to buy it from a wire merchant. The wire spikes in a sand grip “breakaway” style surfcasting sinker should also be made from stainless wire otherwise they will bend too easily and pull out of the bottom defeating their purpose. Finally, you need a heat source. By far the best thing is a portable gas cooker. This can be placed on the concrete driveway outside allowing the toxic fumes to disperse more readily than would be the case indoors. A twin burner is useful as you can use the second element to heat the mould a little before your first pour. This will produce a smoother surface on the finished item. Sinker moulds are sold in good tackle stores. This is a small selection of the sinker moulds available. It might be stating the obvious but molten lead is very hot. Your biggest enemy is water of any kind. A single drop will cause the molten lead to explode firing bits of deadly hot lead back at you. For this reason, always wear safety goggles and protective leather gloves. A full-face visor shield available from hardware stores is an even better option. If like me you have young children the first thing to do is get rid of them completely. Either wait until they have gone to bed, or lock them in the house! The mould will be very hot after lead is poured into it. The melting pot will also be hot, as will the finished sinkers and jigs, and the clamp used to hold both parts of the mould together, hence the need for the leather gloves – and removal of the kids! Molten lead also produces toxic fumes. It is worth wearing a facemask if you can. Inexpensive paper ones are available in hardware stores for about a dollar each. Perhaps the best safety consideration of all is to treat the whole process with respect. Operate at arm’s length. Get all you lead, wires, moulds, cooker and so on, all ready beforehand, and pour all your sinkers and jigs in one sustained operation. The lead will melt in the pot in only a few minutes. You will be amazed at how many sinkers or jigs you can create in a short period once you get the hang of it! Cut off the waste lead from your finished jigs and sinkers with a pair of snips. You can then use a rough file on the jigs to correct any imperfections – though I doubt the fish you are after will notice! Sand-spike surfcasting sinkers. There is the opportunity to make variations of the same sinker by testing different lengths of wire, incorporating swivels and so on. Clear the lead from the eyelets on your jigs. I find a small screwdriver works well for this job. The lead will be quite soft and easy to work. I then paint my jigs completely with white paint. Then allow them to dry thoroughly for a couple of days. I have found that the small jars of “Odds ‘n Ends” paint work very well. It dries quickly and leaves no brush marks. Use a pair of pliers to grip the wire eyelets and you won’t get covered in paint. It is also a good idea to hit a couple of dozen panel-pins part way into a board to act as a drying hanger before you start painting. For a snazzy “shop bought” appearance sure to impress both your fishing mates, and hopefully the fish as well, I spray the backs of my jigs with blue Plasti-Kote metal flake paint (number 311) from an aerosol can. A single can enables you to paint hundreds of jigs! I then paint their eyes, first with yellow, and then add a black pupil. A rounded stick is all that is needed to paint the eyes. Just blot off the excess paint after dipping the stick in the can or jar before applying to the jig. I then like to apply a strip of silver prism tape (available in tackle stores) to the sides of the jig. This will catch the light and reflect all the colours of the rainbow in a shimmering effect that is incredibly “fish-like” in appearance. Finally, a quick spray with clear Plasti-Kote lacquer (number 307) will fix the prism tape in place, and make the jig’s paint finish more resilient and less prone to chipping. All that remains is to attach your hooks with the aid of a stainless steel split-ring. An easier, and cheaper, option is to use double hooks. These can be attached to the bottom eyelet on the jig by simply sliding them on without the need of a split ring. The finished cost of a completed 200-gram jig, minus the double hook, would be under fifty cents.